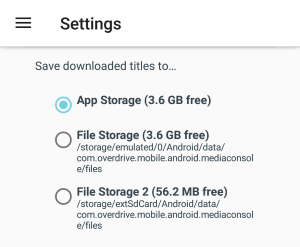 If you don't have enough space to download a title on your Android device, try one or more of our suggestions below. You can remove unused or unwanted apps by going to your device Settings, then going to App Management or Apps. From there, tap an app to find the option to uninstall or delete it. Pictures and videos take up a lot of space on your device. You may want to consider deleting some, or transferring them to a computer, storage device, or cloud storage service. Tap the icon in the top-left corner to open the Home menu, then tap Files. Tap the audiobook part(s) you want to download, then select Download or Download all. Tap the icon in the top-left corner to open the Home menu, then tap Settings. Update the Save downloaded titles to... setting to whatever has the most available space.